The revolutionary iPhone also includes an equally revolutionary screen reader, and other innovative accessibility features that make it easier to use for those with impaired vision. The same VoiceOver screen reader made popular on the Mac is now a standard feature on iPhone 4S, iPhone 4, and iPhone 3GS. It’s the world’s first gesture-based screen reader, enabling you to enjoy the fun and simplicity of iPhone even if you can’t see the screen. What makes VoiceOver on iPhone truly remarkable is that you control it using simple gestures that let you physically interact with items on screen. It’s easy to learn and fun to use. Instead of memorizing hundreds of keyboard commands, or endlessly pressing tiny arrow keys to find what you’re looking for, with VoiceOver, you simply touch the screen to hear a description of the item under your finger, then gesture with a double-tap, drag, or flick to control the phone. VoiceOver delivers an experience unlike any screen reader you’ve ever used before. Traditional screen readers describe individual elements on the screen, but struggle to communicate where each element is located or provide information about adjoining objects. This contextual information is very important but typically filtered out by other screen readers. For example, “off-screen” models used by traditional screen readers to represent applications and web pages intentionally strip away contextual information and describe web pages as a list or menu of items. But with VoiceOver on iPhone 4S, iPhone 4, and iPhone 3GS, you’ll experience something entirely new. Because VoiceOver works with iPhone’s touchscreen, you interact directly with objects on the screen and can naturally understand their location and context. So, when you touch the upper-left corner of the screen, you’ll hear what’s in the upper left corner of a web page, and as you drag your finger around the screen, you’ll learn what’s nearby, providing an amazing new sense of context and relationship between the items you hear. For many, VoiceOver on iPhone will provide, perhaps for the first time, a true sense of how things appear on screen, not just descriptions of what they are. You’ll hear descriptions of every item on the screen, including status information such as battery level, Wi-Fi and cellular network signal levels, the cellular network provider, and time of day. It even lets you know when the display changes to landscape or portrait orientation, and when the screen is locked or unlocked. The speaking rate is adjustable so you can set it to a speed that best suits your listening ability. VoiceOver uses distinctive sound effects to alert you when an application opens, when the screen is updated, when a message dialog appears, and more. And, when Voiceover is talking, the volume of background sounds and music are automatically lowered, “ducking” under the voice, so you can clearly hear what VoiceOver is telling you. VoiceOver includes built-in voices that speak 36 languages including Arabic, Chinese (Cantonese), Chinese (China), Chinese (Taiwan), Czech, Danish, Dutch, English (Australia), English (Britain), English (Irish), English (South African), English (United States), Finnish, Flemish (Belgian Dutch), French (Canadian), French (France), German, Greek, Hindi, Hungarian, Indonesian, Italian, Japanese, Korean, Norwegian, Polish, Portuguese (Brazil), Portuguese (Portugal), Romanian, Russian, Slovak, Spanish (Mexico), Spanish (Spain), Swedish, Thai, Turkish. 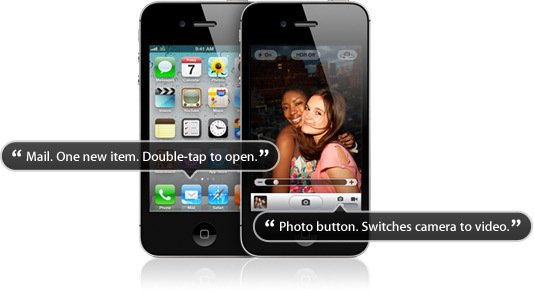 VoiceOver is built right into iPhone 4S, iPhone 4, and iPhone 3GS. There’s nothing extra to purchase or install. All you need is the latest version of iTunes and a Mac or PC. You can activate your iPhone and enable VoiceOver without sighted assistance using Setup Assistant. 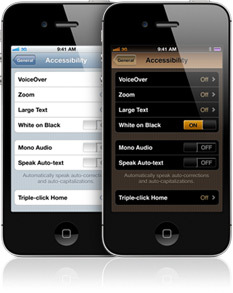 Sighted users can also enable VoiceOver for you directly on iPhone using the Accessibility menu in the Settings application. With VoiceOver enabled, you’ll use a different but simple set of gestures to control iPhone. For example, instead of tapping to activate a button, tap the button to hear a description of it, double-tap to activate it, and swipe up or down to adjust a slider. When an item on the screen is selected, a black rectangle called the VoiceOver cursor appears around it. The VoiceOver cursor is displayed for the benefit of sighted users with whom you may be sharing your phone. When you prefer privacy, VoiceOver includes a screen curtain that turns off the display so no one can read it without your knowledge. When you’re typing text, such as an email message or a note, VoiceOver echoes each character on the keyboard as you touch it, and again to confirm when you enter it. You can also have VoiceOver speak each completed word instead of and in addition to individual characters as you type them. A flick up or down while typing moves the insertion point cursor left and right within the text so you can edit a word just as easily and precisely as typing a new word. To help you type more quickly and accurately, iPhone features word prediction and suggests the correct spelling when you type a word incorrectly. With Speak Auto-text enabled, you’ll hear a sound effect and the suggested word spoken automatically. You can just keep typing to ignore it, or press the space key to have iPhone type it for you. VoiceOver features an innovative new virtual control called a “rotor.” Turning the rotor— by rotating two fingers on the screen as if you were turning an actual dial — changes the way VoiceOver moves through a document based on a setting you choose. For example, a flick up or down might move through text word by word. But when you choose the “character” setting, each time you flick up or down VoiceOver will move through the text character by character — perfect when you’re proofreading or editing text. You can also use the rotor to navigate web pages. When you’re on a web page, the rotor contains the names of common items, such as headers, links, form elements, images, and more. You select a setting, then flick up and down to move to the previous or next occurrence of that item on the page, skipping over items in between. You can use a refreshable braille display that uses Bluetooth wireless technology to read VoiceOver output in braille. In addition, braille displays with input keys and other controls can be used to control iPhone when VoiceOver is turned on. iPhone 4S, iPhone 4, and iPhone 3GS work with many of the most popular wireless braille displays. View a list of supported braille displays. iPhone 4S, iPhone 4, and iPhone 3GS using iTunes when you’re setting up iPhone, for yourself or someone else, or later, using the Accessibility menu in the Settings application on iPhone. Zoom works everywhere, including the Home, Unlock, and Spotlight screens—even with applications you purchase from the App store. A simple double-tap with three fingers instantly zooms in and out 200% and you can double-tap and drag three fingers to dynamically adjust the magnification between 100% and 500%. Even when zoomed, you can continue using all of the familiar flick, pinch, tap and other iPhone gestures to run your favorite applications. For those who need or prefer higher contrast, iPhone 4S, iPhone 4, and iPhone 3GS provide an option to change the display to White On Black. This reverse video effect works in all applications including the Home, Unlock, and Spotlight screens and can be used with Zoom and VoiceOver. Want to select text from websites, emails, messages, and more? Speak Selection lets you highlight text in any application by double tapping it. Even if you don’t have VoiceOver enabled, Speak Selection will read you the highlighted text and give you formatting options like cut, copy, and paste. Turn on Speak Selection in Settings. 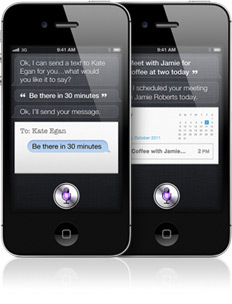 iPhone includes a few, easily discernible physical buttons used to control the phone: the Sleep/Wake button, located on the top edge; the Ring/Silent switch and volume-control buttons, located on the upper-left edge; and the Home button, centered below the display. You can increase the font size to see up to 56-point text in alerts, Calendar, Contacts, Mail, Messages, and Notes. iPhone comes with a stereo headset with a high-performance microphone built into the cable. Plug it into the standard 3.5 mm stereo headphone jack and the headset lets you control music playback and answer and end calls by clicking the built-in remote control button. Several add-on products are also available to work with iPhone that can help those with hearing disabilities, including a hearing aid-compatible induction ear loop from TecEar, wireless remote headset from Oticon, and others. Enjoy hands-free communication using the built-in speakerphone, which you can also use to listen to Visual Voicemail, music, podcasts, and video. Turn the ringer on and iPhone delivers both audible and visual alerts for phone calls, text messages, new and sent mail, and calendar events. Choose to have an LED light flash for incoming calls and alerts. Set incoming calls to display a full-screen image of the caller. Or select an audio option to confirm keyboard actions. In silent mode, iPhone vibrates instead of playing a tone. And it’s easy to know who’s calling because you can select from different vibration patterns or create your own by tapping out custom patterns. To ensure that you never miss a notification, you can have iPhone play an audio alert, too. You can assign distinctive ringtones to individuals in your contacts list, using the ringtone as an audible caller ID. Visit the iTunes Store to create, purchase, and download additional ringtones of your favorite songs (sold separately). The iPhone User Guide has been designed with accessibility in mind. Read the iPhone User Guide in HTML format using a web browser with your favorite screen reader on a Mac, PC, and iPhone. Or listen to the iPhone User Guide in ePub format using VoiceOver in the iBooks app on iPhone (iBooks and the user guide can be downloaded at no charge from the App Store and iBookstore, respectively). You can read the iPhone User Guide in tagged PDF format using the Preview application in Mac OS X and Adobe Acrobat for Mac and Windows.